If Congress can take two weeks off for the Holidays we feel that we should too. This will be our last post until Tuesday January 4. 2011. Asia and Europe were mildly lower overnight. Gold is $1383 and Oil has an $88 handle as the trading day begins. In the week ending Dec. 11, the advance figure for seasonally adjusted initial claims was 420,000, a decrease of 3,000 from the previous week's revised figure of 423,000. The 4-week moving average was 422,750, a decrease of 5,250 from the previous week's revised average of 428,000. Europe closed mixed. Gold was down $18 to $1367 and Oil ended at $87.91. The major market measures closed higher on the day. Breadth was positive and volume light. Happy New Year. Asian markets were mildly mixed overnight as are European bourses at midday. Oil has an $87 handle and Gold is under $14000 as the trading day begins. U.S stocks are going to open slightly lower. (Reuters) - General Electric Co Chief Executive Jeffrey Immelt's problems have changed an awful lot in the past two years. In March 2009, GE officials took to the stage where the company's NBC television network films "Saturday Night Live" to assure investors there was no time bomb hidden in its finance arm that would take down the largest U.S. conglomerate. On Tuesday, Immelt faced the same room, this time full of investors who were worried he would let the world's top maker of jet engines and electric turbines build up too much cash. GE expects to end the year with $20 billion in cash on hand and within the next few years could have $30 billion to deploy on takeovers, share buybacks and further dividend hikes. "I don't want to be arrogant about it. It's not Jeff Immelt's cash. It's investors' cash," said the CEO. "I want to deploy it in an investor-friendly way." Immelt has three plans for the money: Further hikes to the dividend -- which GE has raised twice this year -- more share buybacks and small-scale takeovers. He took pains to explain to shareholders that GE did not plan to amass the entire $30 billion reserve before it began spending it. "It was meant to be a conceptual chart," Immelt said of the potential war chest discussed at Tuesday's meeting where he also told investors that profit would be up "strongly" in 2011. "It's more conceptual to let you dream: 'Look at all that cash, Jeff.'" The Fairfield, Connecticut-based company, which on Monday said it would acquire U.K. oil equipment company Wellstream Holdings for $1.3 billion, plans to keep its takeover focus on deals valued from $1 billion to $3 billion, Immelt said. Deals of that size, while small in the context of a company with a $188.48 billion market capitalization, provide the best payoff, he said. "You could do a $15 billion deal if you wanted to," Immelt said. "I don't want to. Because you don't make money on the integration." Some investors agreed smaller deals have a better payoff than blockbusters valued at tens of billions of dollars. "The big deals can be the tough ones," said Mike McGarr, a portfolio manager at Becker Capital Management in Portland, Oregon, who holds GE shares in his funds. "It will take a lot of small ones to move the needle, but it can be done." McGarr cited Illinois Tool Works (ITW.N) as an example of a company that has grown successfully through small deals. Investors also said that carefully priced takeovers offered better long-term growth potential, particularly in an uncertain economic environment where organic growth is harder to find. If there's a good deal to do, in terms of fit where you can make the numbers work, that's always plan A. Plan B is returning cash to shareholders," said Brian Langenberg of Langenberg & Co. Still, having seen GE's shares plumb 18-year lows in the past two years and endured a chop of the dividend from 31 cents per quarter to 10 cents, shareholders want more. This year's two-step hike of the dividend by 37 percent is just the beginning, in some shareholders' minds. (CNBC) Industrial output rose 0.4 percent in November, according to Federal Reserve data. That's above an expected gain of 0.3 percent, according to economists surveyed by Reuters. In October, industrial product fell 0.2 percent from a previously reported flat reading. The November reading was the biggest gain since July. Capacity utilization rose to 75.2 in November, from a revised 74.9 in October, still far below its long-term average. Capacity utilization measures how fully firms are using resources. The Consumer Price Index rose 0.1 percent in November, the Labor Department reported. Excluding volatile food and energy prices, the core CPI also rose 0.1 percent. Economists surveyed by Reuters had expected the CPI to rise by 0.2 percent. Also, The New York Fed's "Empire State" general business conditions index gained 22 points to 10.57 in December from a drop of 11.14 in November. The index was boosted by growth in new orders and shipments, the New York Federal Reserve said....In other economic news, the Mortgage Bankers Association said applications for home loans fell last week as mortgage rates hit a seven-month high. Best Buy is down $8 to $34 and change in the last two days and we added a few shares to our large accounts. BBY lowered earnings estimates for the year to a 3% year over year gain from a projected 10% plus year over year gain. We also added a bit of GE to larger accounts and halved our Dell position at a 30 pennies loss. Europe closed lower while Oil gained to $88.53 on a greater than expected inventory drawdown. Gold ended down $20 at $1383. The major market measures opened slightly higher then moved slightly lower at midday and mildly lower on the day. Breadth was negative and volume light. Retail Sales were up for the 5th month in a row. Countering the good retail sales news, Producer Prices were up 0.3% in November when a negative number was expected. Bears, of course, will annualize it while bulls will say the number is an anomaly. Asian markets were higher overnight while European bourses are mixed at midday. Gold is back above $1400 and Oil has an $88 handle. (Forbes) Like many PC stalwarts, Nvdia wants to branch into the fast-growing mobile devices market. The California-based maker of high-end graphics processors may be on the verge of a breakthrough. Ambrish Srivastava, a semiconductors analyst with BMO Capital Markets, says he expects Nvidia chips to show up in a number of tablet PCs next year. Srivastava’s remarks came from a Dec. 13 call with investors that summarized findings from a recent BMO trip to East Asia. A group of analysts, including Srivastava, spent a week visiting more than 30 tech companies in Japan, South Korea, Taiwan, China and Hong Kong. The meetings led Srivastava to believe that “a lot” of PC makers will use NVIDIA’s Tegra chips in upcoming tablets. The Tegra line, which NVIDIA first introduced in 2008, is designed to be particularly power efficient and thus a good fit for mobile devices. “NVIDIA is clearly emerging as one of the top design wins [in the tablet space],” said Srivastava during the call. That would be welcome progress for NVIDIA, whose highest-profile mobile device launch this year was Microsoft’s ill-fated KIN phone line. Microsoft folded the KIN project in late June following weak sales. Next year looks to be much more productive in terms of mobile devices. Tegra chips have already been spotted in several soon-to-launch, highly anticipated gadgets, including Motorola’s first tablet and LG’s Android-based “Star” phone. NVIDIA may have picked up another, more surprising customer recently: Samsung. Srivastava said he thinks the next Samsung Galaxy tablet will be based on an NVIDIA chip. Up to now, Samsung has relied on its own processors, which it calls Hummingbird, to power its Galaxy line of smartphones and tablets. (Barron’s, December 9) Following on the item a short while ago about Barclays Capital’s reaction to rumors of Nvidia losing the graphics processing slot in Apple’s MacBook laptops, Rajvindra Gill with Needham & Co. remarks this afternoon that the whole matter is basically a dead horse. “This is not news,” Gill tells me this afternoon by phone. “The fate of the chipset business has been telegraphed for some time now by management and by the Street.” Chipsets are a business Nvidia is exiting, so it’s really all about the pace of the run-off of that business. Gill estimates that of Nvidia’s $150 million per quarter in chipset revenue, $100 million comes from Apple. He sees sales at Apple falling to $50 million in Q1 of next year, as MacBooks are released with Intel’s (INTC) Sandy Bridge processor. However, Nvidia will still get about $50 million per quarter from the MacBook Air, which was released this past fall and which likely wouldn’t have a major redesign before next fall. As for the rumor Nvidia may also lose the slot for its discrete graphics chips in the higher-end MacBook Pro 15-inch and 13-inch models, that’s actually not such a bad thing, Gill opines. That business, which is in much lower volume than the MacBooks, is perhaps $30 million or so of revenue per year for Nvidia, but at a much lower margin. The price on a discrete graphics processor for MacBook Pro is probably about $25, estimates Gill, versus $35 for the company’s chipsets. So the loss of that low-margin business might be a good thing in the end. More important, Gill, like Barclays’s Tim Luke, is enthusiastic about Nvidia’s “Tegra” processor for tablet computers; its “Quadro” chip for high-end graphics processing, which is aimed at CAD/CAM workstation applications, oil drilling, and the like; and Nvidia’s “Tesla” chip for the data center. (Bloomberg) -- Voyager 1, the unmanned space craft launched by the U.S. National Space and Aeronautics Administration when Jimmy Carter was president, is on the verge of leaving the solar system, over 10 billion miles from earth, the British Broadcasting Corp. said, citing mission officials. Voyager, launched in September 1977, is signaling through its radioactive power pack that there is a distinct change in the direction of the flow of particles from the sun, which are no longer traveling outwards but sideways, the broadcaster said. This means Voyager is on the verge of making the jump into interstellar space, probably within the next five years, the BBC said. Radio signals from Voyager are now taking 16 hours to arrive on earth, the BBC reported. Retail sales surged 0.8% in November, almost double what most market participants were expecting. The government also revised up what were already strong numbers for October. Sales excluding vehicles were up a more substantial 1.2%, supported by earlier-than-usual Black Friday promotions. Gains were fairly broad -based across big-box retailers, apparel stores and online vendors. We also saw more spending at the gas pump as energy prices picked up. The weak spots were electronic store sales and restaurant tabs. Middle and lower income households, in particular, tend to make trade-offs and eat out less when prices at the pump rise. Separately, the producer price index rose 0.8% in November, slightly higher than expected on the heels of higher energy prices. The index excluding food and energy rose 0.3%, which was also slightly hotter than expected. Year-over-year gains in the overall index, however, moderated slightly. Moreover, little if any of those increases have made it into consumer prices. If anything, consumers have shown a proclivity to shop for deals and discounts as much as ever this holiday season. The Bottom Line: Retail sales suggest that the economy is in fact reaccelerating, which is welcome news ahead of the Christmas holiday. Nothing in today's data, however, will stop the Federal Reserve from moving forward with plans to ease further with large scale asset purchases. One could only hope that the economy is strong enough in the first half of the year for the Fed to cut short its efforts to stimulate. We have a long way to go from here, however, to get there. Inflation is still too low and unemployment too high for the Fed to declare victory. (WSJ) Federal Reserve officials stuck to their easy-money policy of buying U.S. Treasury bonds and keeping short-term interest rates near zero. The Fed was restrained in its assessment of the economy. The recovery is continuing, "though at a rate that has been insufficient to bring down unemployment," the central bank said in a statement at the end of the meeting. Fed officials also reaffirmed that their plan to buy $600 billion in U.S. Treasury debt through June would be subject to regular reviews and may be adjusted depending on how the economy fares. Many Fed officials believe the policy is working, though results have been mixed at best. Bond yields and the dollar fell in anticipation of the Nov. 3 decision to initiate the program, but both have jumped as stronger economic data and the tax-cut deal led investors to expect more growth and inflation -- and to worry about budget deficits. European bourses were mildly higher at their close. Oil ended at $88.31 and gold at $1396.50. The Major Market Measures were higher all day but as yesterday lost the gain in the last hour of trading. The DJIA, NAZZ, and S&P closed higher. Breadth was flat and volume light. Cyclicals were strong for the second day while financials were flat. Drug stocks also saw some buying. We have returned having survived a Saturday night blizzard. Stocks are going to open slightly higher as economists now predict growth for next year and an S&P 500 that will close 11% higher than it closes this year. Since we don’t know what the close this year will be and we also don’t know what will occur in between the beginning and end of next year the prediction of 11% growth has not much value except for investors who are immune to 20% up and down moves. We aren’t in that category. Asian markets were higher overnight as is Europe at midday. GE is buying a gas pipe manufacturing company and Dell and Compellent have a definitive merger agreement. We repurchased GE and Ford on Friday and also added the Financial ETF (XLF) to accounts. (NYT) Huntington Bancshares, a Columbus, Ohio-based regional bank, on Monday announced that it had commenced a $900 million offering of its common shares. The bank also said it would sell $300 million in an offering of subordinated debt. Huntington said it would use the proceeds of the offerings to help buy back $1.4 billion of the preferred shares it had issued to the Treasury Department under the Troubled Asset Relief Program, or TARP. In a note this morning, Miller Tabak + Company said it estimated that the equity offering would increase the bank’s outstanding common shares by 18 percent. “We see it as providing a solid equity base for business growth in 2011-2012.” Goldman Sachs will act as sole bookrunner and Sandler O’Neill will act as co-manager for the proposed equity offering. Notice that Goldman is running the books, more fees for the wealthy. Other regional banks will be selling shares to raise capital now that the appetite for banks has revived. (Bloomberg) Great Atlantic & Pacific Tea Co., which operates almost 400 supermarkets under the Waldbaum’s, The Food Emporium and Pathmark names, sought bankruptcy protection after failing to successfully compete with wholesale clubs and drugstores. The retailer had $8.8 billion in sales for the year ended in February, according to its website. Yesterday, it listed assets of $2.5 billion and debt of $3.2 billion in a Chapter 11 filing in U.S. Bankruptcy Court in White Plains, New York. We repurchased KBE in some accounts. We also repurchased Fifth Third in accounts in which we sold last week. The share price is down 3% today although higher than the price at which we sold. The drop today relates to the Huntington Banks stock offering (see above) and the logical surmise by traders that Fifth Third will be doing the same. We agree although our guess is that any offering awaits a higher stock price. We added to our Talbots warrants in accounts and repurchased Nvdia in some accounts. Oil ended at $88.46 and Gold gained $11 to $1396. European bourses closed mildly higher. The major market measures were higher all day but in the reverse of last week’s action they weakened near the close the DJIA and S&P closed higher while the NAZZ ended lower. Cyclicals were up and financials down. Breadth was negative and volume light. We will be taking tomorrow off. We are going to visit an exhibit where a quilt of the old stockbroker’s ties is being exhibited. Below is a picture of the quilt plus a short description of how it was created. When Chicago stock analyst Harry A. Baum died, his many silk neckties were passed on to his stepson, Bud Lemley. Several years later, Bud's wife, Katie, asked fiber artist Diane Craig to transform the neckties into a quilt for Bud. In the past, Craig had designed and stitched quilts with pictorial appliqué centers framed by pieced borders. But this time she chose a traditional pineapple pattern because it required long narrow pieces of cloth. To actually work with the neckties, they had to first be taken apart, linings removed, sometimes washed, and then ironed. Then Craig separated them into light and dark piles. One of the concerns with the neckties was that the fabrics were often very delicate. 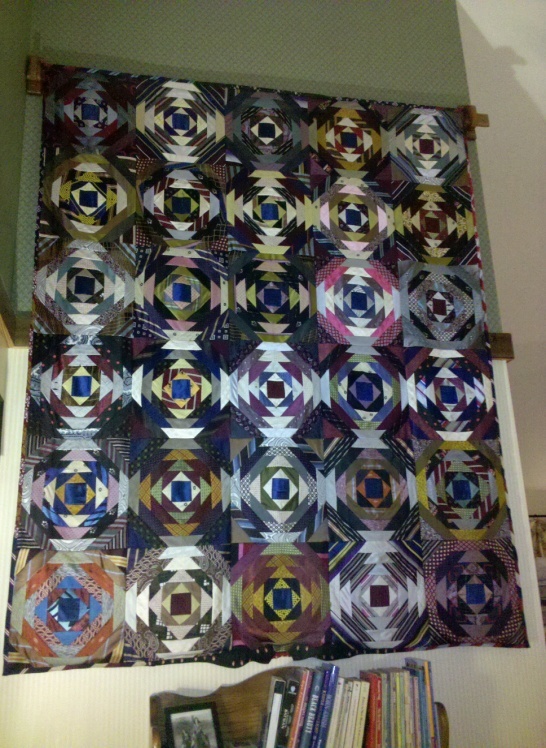 Since this quilt was intended to hang on a wall, it needed to be well stabilized. Craig cut a 12-inch piece of cotton muslin as a backing for each block. Then, starting with a blue center square, she worked around and around the square, stitching each strip over first the exposed raw edge of the blue square and pressing with an iron up toward the outer edges of the block where the exposed raw edge would be stitched down by the next round. The necktie Baum wore to his office for his 79th birthday party, where the photograph was made, has found its way into nine of the quilt's squares. The bottom edge of the quilt includes one of his bowties. Asian and European markets were higher overnight. Oil has an $88 handle and Gold is flat as the trading day begins. Yankees offer baseball pitcher Cliff Lee $140 million over 6 years. Jeter got $51 million for three years. Nice work if you can get it. (NYT) Dell, thwarted this summer in an effort to acquire 3Par, said on Thursday that it was in advanced discussions to buy another data storage company. Dell has an exclusive agreement to negotiate a deal for Compellent Technologies for $28.50 a share in cash. That is a discount of nearly 19 percent from Compellent’s closing stock price on Wednesday. But shares of Compellent have had a huge run-up in the last two months on speculation of a takeover. More fuel was added on Tuesday, when the company’s chief financial officer canceled an appearance at a Barclays’ technology conference scheduled for the next day. Dell’s offer would value Compellent, based in Eden Prairie, Minn., at $876 million. After 40 years in the business we aren’t immune to hubris- which swiftly disappears when we suffer a loss for violating one of our rules. After we made the nice trade in Barnes & Noble over the weekend we were overly aggressive in purchasing Talbots over the past few days. We are cutting the position in half today. With a small portion of the money we are buying Talbot warrants at $1.25 equal to the Number of shares we sold. Talbots has warrants to buy shares at $14.85 through April 2015. We are going to be adding them to accounts as we can as long term calls on the stock. Each warrant entitles the holder to purchase One (1) New share of Common Stock (NYSE Symbol "TLB") at an exercise price of $14.85 per share. The Talbots Warrants commenced trading on the NYSE Amex on April 21, 2010, under the ticker symbol “TLB.WS.” There are 17.2 million warrants outstanding with an expiration date of April 6, 2015. Beginning after one year from the date of issuance, Talbots will have the right to accelerate the expiration of the warrants under certain conditions, including if the trading price of shares of Talbots common stock exceeds $19.98 for any 20 trading days within a 30 day trading period. Europe ended mostly higher. Oil closed at $88.36 and Gold finished at $1387. The major market measures closed mixed again today. Volume was light and Breadth flat. We’ll be back on Monday. Asian and European markets were mildly lower overnight and Gold is under $1400 while Oil has an $88 handle. U.S. futures indicate a slightly lower opening. (China Daily) China's banking regulator has ordered lenders to tighten controls on their loans to property developers, its national television reported on Tuesday. It ordered banks to reinforce investigations before extending the loans and strengthen oversight after the loans are made," the television said. In September, the China Banking Regulatory Commission (CBRC) sent a list of property developers under the central government to lenders, it said without elaborating. Domestic media reported earlier this week that CBRC ordered banks to confine their new loans to 16 developers on the list. China ordered State-owned firms to divest from the real estate industry, except those with property development as their core businesses. In addition, Beijing has issued a slew of measures in recent months to cool the red-hot property market, including raising mortgage rates and down payments. (WSJ) Roughly one in three Medicare beneficiaries diagnosed with prostate cancer today gets a sophisticated form of radiation therapy called IMRT. Eight years ago, virtually no patients received the treatment. The story behind the sharp rise in the use of IMRT—which stands for intensity-modulated radiation therapy—is about more than just the rapid adoption of a new medical technology. It's also about financial incentives. Taking advantage of an exemption in a federal law governing patient referrals, groups of urologists across the country have teamed up with radiation oncologists to capture the lucrative reimbursements IMRT commands from Medicare.... treatment options range from IMRT, which costs Medicare as much as $40,000 for a full course of radiation in places such as New York, to a cheap approach known as "watchful waiting," which means simply monitoring the cancer with regular office visits and tests. Medicare pays up to $16,000 for a prostatectomy—surgery to remove the prostate—and as much as $19,000 to implant radioactive seeds to kill cancerous cells.... New York is home to the largest urology self-referral group in the nation, Long Island-based Integrated Medical Professionals PLLC. Created in July 2006, Integrated Medical has grown to 103 doctors across six counties and owns 11 linear accelerators, the massive machines used to deliver radiation. Integrated Medical is headed by a urologist named Deepak Kapoor. "Is radiation a line of business for us? Yes," Dr. Kapoor said in a July interview at the group's main radiation facility. But, he added, IMRT wasn't the practice's most profitable activity, and use of the treatment was driven by patients, not by the practice's doctors. Asked during the interview what proportion of its prostate-cancer patients Integrated Medical treats with IMRT, Dr. Kapoor said he didn't track such data closely, but said he would be "comfortable" with an estimate of "one out of six," or 17%. An analysis of Integrated Medical's Medicare claims later performed for the Journal suggested a much higher rate. Between its launch in mid-2006 and the end of 2008, Integrated Medical administered IMRT to 601, or 53%, of 1,132 Medicare patients recently diagnosed with prostate cancer, the Journal analysis found..... Integrated Medical received $26.7 million from Medicare for the care of those 601 patients, according to the Journal's calculations. If Integrated Medical's urologists hadn't owned radiation equipment and had referred these patients for radiation treatment outside of their practice, Medicare would have paid them only $2.6 million. Investors Intelligence had 56% Bulls, 21% Bears. Treasuries have been dropping in price this week as yields rise. We noticed last night while watching the local news that the local credit union’s 30 year mortgage rates had climbed back to 5% after being as low as 4.5% a few months ago. The sale of the government stake in Citi yesterday required a re-weighting of the S&P 500 index with corresponding sale of the other 499 issue in the Index. That was one and maybe the main reason for the late day sells off. If it was today’s first hour of trading should recapture most of the lost gain. We have a higher cost on Talbots in some of our large accounts and so we added shares on today’s further drop. We also added shares of CWTR to many accounts as it dropped to a new yearly low priced at less than one half sales and right at book value. With the Investors Intelligence Bull/Bear ration so bearish (because the number of Bulls approach 60% and the number of Bears will soon drop below 20%) we don’t want to commit new funds to the fray. And so we sold Medtronic in our large accounts a slight gain and Chesapeake Corp and Fifth Third in all accounts for a 6% profit. European bourse indexes closed mixed. Oil ended at $88.44 and Gold at $1383. The major market measures closed slightly better on the day in light trading. Cyclicals were lower as it looked as if money was flowing from them into financials which were higher. Breadth was negative on the day. The tax bill is settled, millionaires keep their money to spend and the unemployed get their pittance for another year. All is well is in LaLa Land and the markets in the U.S. are celebrating. The deal:http://www.nytimes.com/2010/12/07/us/politics/07cong.htmlThe payroll tax relief is a nice addition. Asia was mildly higher overnight and European bourses are up 1% and more at midday. Gold is up $10 at $1427 while Oil has a $90 handle. No credit card companies or banks or hosting websites said they would refuse Wikileaks before the government downloads. (TPMMuckraker) MasterCard and Visa have announced they will stop processing payments to Wikileaks, following similar moves by Amazon.com, PayPal and other businesses who are cutting ties to the organization. MasterCard Worldwide "is taking action to ensure that Wikileaks can no longer accept MasterCard-branded products," a spokesman told CNET late yesterday. "MasterCard rules prohibit customers from directly or indirectly engaging in or facilitating any action that is illegal," the spokesman said. Today, Visa Europe announced it is also beginning the process to stop payments to Wikileaks. Visa didn't go as far to say Wikileaks is engaging in illegal activity; instead, Visa said the suspension is pending an investigation. A spokeswoman told BBC that the investigation will examine Wikileaks' business and whether it violates Visa rules. Talbots beat on earnings but disappointed on revenues and reduced fourth quarter expectations and is down $2.50 per share. We are adding to accounts. Talbots has reduced debt by $400 million and is a great speculation at present levels. 12/7 (thestreet.com) ...Despite ... disappointing earnings report, UBS analyst Roxanne Meyer said she would be a buyer of the stock on today's weakness. Shares are currently down 22.8% to $8.77 in early morning trading. "While patience is required as the second half of 2010 turned out not to be inflection quarters, we continue to view the company as well positioned for a turnaround in 2011, given product improvement and given the company is still in very early innings of increased marketing, catalog prospecting, store-level product allocation and store renovations," Meyer wrote in a note. 12/7 (www.schaeffersresearch.com) On the earnings front, The Talbots Inc. (TLB) reported that third-quarter earnings from continuing operations were $17 million, or 24 cents per share, up from $15.5 million, or 28 cents per share, a year earlier. Sales for the period fell 3.2%, and Talbots said that it sees fourth-quarter sales to hold flat or fall in the low single-digit percentage range. For the fourth quarter, Talbots forecast a loss of 5 cents a share to a profit of 3 cents per share. Keying off the poor guidance, investors have sent TLB roughly 22% lower today. In fact, TLB has gapped well below former support at the $9.50 level, with the shares trading south of the $9 level - territory the stock has not explored since the first week of 2010. Sentiment, meanwhile, is mixed on TLB. The stock's Schaeffer's put/call open interest ratio (SOIR) of 0.51 arrives near the midpoint of its annual range, while eight of the 11 analysts following the shares rate them a "buy" or better. Finally, more than 29% of TLB's float has been sold short. The Treasury Department said it has priced a public offering of around 2.4 billion shares of Citigroup common stock at $4.35 per share. The proceeds amount to $10.5 billion. Citigroup shares were up 2.9% premarket. The Government is out of Citigroup with a $12 (?) billion profit. President Obama took to the airwaves last night to announce that his administration has come to an agreement with Republican leaders in Congress regarding the extension of almost all of the Bush-era tax cuts for two years. Even the exemption on estate taxes is to be extended, with the exception of individual estates worth more than $5 million, which will owe 35%. The deal also includes administration-backed cuts to payroll taxes, 100% deductions for research and development (R&D) investment and extensions of R&D credits already in place from the stimulus package. In return, Republicans agreed to extend unemployment insurance for the long-term unemployed for a full 13 months. This is not only an acknowledgement that the unemployment situation isn't going away any time soon, but that it will soon be the Republicans' burden to bear when they assume the majority in the House next year. The resolution, which seems likely to be passed, despite some pushback from liberals on the tax cuts for the wealthiest families, will provide a much needed backstop for an economic recovery that remains extremely fragile. It will also bring some relief to the Federal Reserve, which has been forced to carry the burden of recovery on its shoulders in recent months, even though it didn't have the necessary tools to do so. Federal Reserve Chairman Ben Bernanke seemed almost to be begging for some sort of fiscal stimulus when he defended the need for QE2 (additional quantitative easing) in recent weeks. Nothing, however, is free and one can only hope that now that we have moved beyond the cyclical debate on fiscal policy, we will find some grownups in Congress to embrace a more meaningful discussion about reining in the structural budget deficit. We have just bought ourselves two years (likely less given the 2012 election cycle) to come up with meaningful revenue and spending reforms that phase in gradually over the next five-to-ten years or longer. The President's bipartisan budget commission recommended that an increase in the retirement age to 68 be phased in over 40 years. If our 28-year-olds can't figure out how to save a little more, to work a few more years, forty years from now, then we as a nation are even more childish than I believed. The Bottom Line: Tax cuts and extensions to unemployment insurance are essential, along with efforts by the Fed to further stimulate to get the economy out of a "stall zone" on growth. That said, there are no guarantees, and the road ahead is still rocky. Moreover, the hard debate on the deficit, which I have always argued should not have been lumped in with the cyclical debate on stimulus, needs to get underway. We added Fifth Third Bank to accounts that own Dell. Aéropostale is up the past two days after Goldman placed a sell on the shares. The rumor is that private equity firms are interested. We are selling for a $1 two day profit because we placed a large chunk of funds in Talbots this morning and the discipline is to maintain a semblance of balance in portfolios by industry. There are ten takeover rumors for every on that occurs and with the recent executive shakeup at the company –and insiders not owning any stock- we wonder how those folks who are left would benefit. Anyway, thanks to the rumor mongers for the two day 5% profit. With the continuation of the 100% deduction for businesses for capital expenditures for the next year –it just went into effect a month ago- we added to our Dell and Hewlett Packard positions. Gold reversed and closed down $4 at $1411. Oil ended at $88.58. European stocks closed at their highs. Asia and Europe were lower overnight with Oil close to $89 and Gold at $1415. U.S. futures indicate a slightly down opening. We are watching CNBC learning that a nonprofit organization (a/k/a- a charity) is co-sponsoring a race car driver on the NASCAR circuit. The Drive to End Hunger will sponsor the car of Jeff Jordan in 2011, 2012, and 2013. Call us crazy but that’s nuts. (WSJ) ... In a Sunday interview on CBS News's "60 Minutes," Mr. Bernanke said the Fed could commit more money to boost the economy after last month announcing $600 billion of asset purchases. He said any decision would depend on inflation and the efficacy of the existing program, as well as how the economy looks overall. Still, he said he doesn't think a double-dip recession in the U.S. is likely. (AP) -- Activist investor William Ackman on Monday offered to finance a $16 per share Borders-led takeover bid for rival bookseller Barnes & Noble Inc.
Ackman and his Pershing Square Capital Management in a regulatory filing that they would be willing to fund an offer of $16 per share in cash for Barnes & Noble. With about 60.2 million shares outstanding, that would value Barnes & Noble at about $963.2 million. That is nearly 21 percent more than Barnes & Noble's closing price Friday of $13.38 a share. Barnes & Noble shares rose $2.31, or 17.4 percent, to $15.59 in pre-market trading. In the filing, Ackman disclosed a 37 percent stake in Borders, up from 31.5 percent in May. As an alternative to the $16 per share cash offer for Barnes & Noble, Ackman said in the filing he would finance a combined stock and cash offer. Goldman Sachs lowered its price target on Barnes & Noble to $12 last week reinforcing existing price weakness and adding the drop in the share price. With the closing price on the shares Friday at $13, a $16 price offer seems reasonable. Just saying. By the by, Borders is in worse financial straits than BKS. (Bloomberg) Aéropostale.... was cut to “sell” from “neutral” by Goldman Sachs; American Eagle Outfitters.... was raised to “buy” from “neutral” by Goldman Sachs. (AP) -- Teen retailers Abercrombie & Fitch Co. and American Eagle Outfitters Inc. may see their businesses improve next year, helped by better economic conditions and "favorable fashion trends, a Goldman Sachs analyst said Monday. The analyst, Michelle Tan, raised both retailers' ratings, adding Abercrombie & Fitch to Goldman's "Conviction Buy" list from "Buy" and boosting American Eagle to "Buy" from "Neutral." She said teen unemployment may be waning, with improvements seen in each of the past three months. More teens working could mean more money for retailers that target the demographic. Tan also said in a client note that Pittsburgh-based American Eagle and Abercrombie & Fitch, which is based in New Albany, Ohio, could also capitalize if there is a shift to more classic, casual teen clothes. "After 3.5 years where edgier trends like dresses and skinny jeans hurt Abercrombie & Fitch and American Eagle, we see early signs that the cycle may move back in their favor," she said. Shares of Abercrombie & Fitch gained 15 cents to $56.30 in afternoon trading. The stock hit a 52-week high of $57.06 earlier in the session. American Eagle's stock climbed 23 cents to $16.01. We sold BKS for a one week $2 (15%) per share profit. (Barron’s.com) Oppenheimer & Co.’s Ittai Kidron this morning raised his rating on Cisco to Outperform with a $23 price target, writing that sentiment is so bad on the company; it’s a good time to consider owning the shares. Kidron cut his estimate for the fiscal year ending next July to $43.1 billion from a prior $44.2 billion, below Street consensus of $43.67 billion. His EPS estimate, at $1.60, is down from a prior $1.67 and below the Street’s $1.61. Those numbers “appropriately reflect concerns of share losses and margin pressure,” writes Kidron. Though things could be “bumpy” for the stock, Kidron argues his reduced view, and the negative sentiment on the company, both capture the prospect of further erosion by competitors. Kidron’s gone through the product line, trimming estimates in areas such as the set top box business (housing woes), while taking a bullish view of things such as the Unified Compute Server, the core of Cisco’s push into data center computing. He notes that that business is on a half-a-billion-dollar run rate, as of the first quarter of this fiscal year, with 2,800 customers. We traded out of Goodyear for a 3% to 5% gain. We have been trading GT because it has 5% moves almost weekly. We also added to our CSCO (at a 15 month low) holdings on the Oppenheimer upgrade and the “cloud” computing (very hot right now) news. Oil ended flat at $89.06 and Gold gained $10 to $1416. European bourses closed mildly lower. The major market measures closed mixed small. Breadth was negative and volume light. Payrolls improved by 39,000 which was less than expected and markets are lower on that news. Private sector jobs grew by 50,000. European and Asian markets were higher overnight. http://seekingalpha.com/article/239622-top-stock-picks-in-three-out-of-favor-groups Concerns of new taxes and tougher product safety reviews have added to the woes of medical device companies that are already intensely battling each other amidst a slowdown in sales. My top pick in this industry is Medtronic (MDT) whose shares are down 24%. The company’s sales have come under pressure as high unemployment and rising insurance costs have caused patients to cut down on doctor's visits. Meanwhile, Medtronic is looking to both in-house R&D and acquisitions to diversify its product base. Medtronic shares are a good bet if you believe patients cannot postpone the usage of medical devices forever. Increasing accessibility of more Americans to medical care is likely to increase demand for Medtronic’s devices over time. The company is also seeing growth opportunities in emerging markets where it plans to triple its revenue in the next five years. Medtronic shares trade at a relatively modest 9.3 forward P/E. They offer a meaningful 2.7% dividend yield that can compensate investors a bit while waiting for the business environment to improve. The jobless rate: for adult men (10 percent); for adult women (8.4 percent); for teenagers (24.6 percent); for whites (8.9 percent), blacks (16 percent); Latinos (13.2 percent); Asians (7.6 percent). Rates for American Indians are larger than all these but not included because the government's survey sample is too small. The number of people employed part-time because they can't find a full-time position fell from 9.2 million to 9 million. The average workweek for all employees on private nonfarm payrolls held at 34.3 hours. In professional and business services, employment in temporary help services was up 40,000. Retail trade fell by 28,000. Coldwater Creek announced a loss for the quarter and was gloomy for the Christmas quarter also. We are adding shares now that the news is out of the way, below are comments by the CEO who is also a 30% owner of the company. "Our third quarter operating results were in line with the revised outlook we provided in mid October. This was a disappointing quarter for us as our fall merchandise assortment was not well received by our customers," stated Dennis Pence, Chairman and Chief Executive Officer of Coldwater Creek. "On a positive note, we continued to tightly manage expenses with SG&A for the quarter down approximately $23 million from the third fiscal quarter last year." Mr. Pence continued, "We expect the challenges we experienced in fall to continue during the fourth quarter. As we move forward, our highest priority is to continue to reposition the Coldwater Creek brand to better address the needs of our target demographic. We are focused on improving our collections to offer a more compelling fashion sensibility and while we recognize that the transition will take some time, our April deliveries will begin to reflect our new design aesthetic being led by Jerome Jessup and his new design team." Gun to our head our guess is that markets rally into the New Year and then correct. The markets are hesitant this morning and given the rally of this week we sold KBE and Ford for plus scratches and GE for a 5% two week gain with the hopes of reinvesting at lower levels. (WSJ) European stocks fell for the first time in three sessions following a disappointing U.S. jobs report. The Stoxx Europe 600 index ended down 0.2% at 270.94, leaving it with a gain of 1.6% for the week, its best weekly showing in a month. Oil closed at $89.18 up $1.20 and Gold at $1416 up $29. The major market measures closed higher on the day with a rally in the last half hour. Breadth was 3/2 positive and volume light. Markets around the world were higher overnight in response to yesterday’s large percentage gain in the U.S. Markets in the U.S. look to open mildly higher this morning and then we will see how much strength remains. Gold is $1391 and Oil as an $86 handle as the trading day begins. Jobless claims were up 26,000 to 436,000. The Monthly Employment Report is released tomorrow morning. (WSJ) A mystery buyer is apparently holding more than half of the copper stocks at the London Metal Exchange's warehouses, the latest revelation of how a single trader can roil an entire commodities market. That trader, whom the exchange hasn't identified, owns between 50% and 80% of the 355,750 metric tons held in LME-listed warehouses. McSurance on Trial: A Senate committee puts the spotlight on the crap health insurance given fast-food workers. (WSJ) The European Central Bank will continue to offer special longer-term liquidity measures in 2011, ECB President Jean-Claude Trichet said. The extra liquidity measures were due to be phased out early next year, so the new decision should offer some relief to the euro-zone's troubled debt markets. After Trichet's remarks, the euro edged down against the dollar to $1.3061, while key euro-zone government bond yields were broadly stable. Earlier in the day, the ECB left its main interest rate unchanged at 1.0%, with Trichet saying the rate was "appropriate" given "contained" inflationary pressures. Buy on bad news: we added shares of American Eagle (see bad news/ good news below same store sales flat/ 50 cents special dividend) and also initiated a new position in Aéropostale at $23.40 down $3.40 on the day. An analyst downgraded shares of Aéropostale Inc. on Thursday while others said they see continued problems for the teen retailer, a day after the company said its co-CEO is stepping down and it reported its third-quarter profit 1ell below expectations. The company also said revenue at stores open at least a year fell last month and it issued a disappointing fourth-quarter outlook. The stock fell nearly 11 percent in early trading, losing $2.90 to hit $23.90. The stock has traded between $19.10 and $32.24 in the past year. In a note to clients, Wedbush analyst Betty Chen cut shares to "Neutral" from "Outperform." Chen said the disappointing fourth-quarter "highlight the challenges of delivering sales on top of difficult comparisons and corresponding margin declines." The analyst thinks the need for deep discounts to move merchandise will continue to hurt margins through next year. Also, she believes the departure of co-CEO Mindy Meads, who spearheaded the merchandising effort, "product mishaps may materialize." KeyBanc Capital Markets analyst Edward Yruma, who already has an "Underweight" rating on the stock, says he sees continued potential for the stock to lose value. He thinks Mead's departure "points to a company struggling to regain its footing." He lowered his earnings estimates on the company for the fourth-quarter and full-year and maintained his $20 price target. (Yahoo) Aéropostale, Inc. operates as a mall-based specialty retailer of casual apparel and accessories. It designs, markets, and sells merchandise principally targeting 14 to 17 year-old young women and men. The company offers a collection of apparel, including graphic t-shirts, tops, bottoms, sweaters, jeans, and outerwear, as well as accessories, including sunglasses, belts, socks, and hats. It also offers casual clothing and accessories focusing on elementary school children between the ages of 7 and 12. In addition, the company sells its products through its e-commerce Website, aeropostale.com. As of March 15, 2010, it operated 895 Aéropostale stores in 49 states and Puerto Rico; 44 Aéropostale stores in Canada; and 15 P.S. from Aéropostale stores in 6 states. The company was formerly known as MSS-Delaware, Inc. and changed its name to Aéropostale, Inc. in February 2000. Aéropostale, Inc. was founded in 1987 and is headquartered in New York, New York. The Pending Home Sales Index,* a forward-looking indicator, rose 10.4 percent to 89.3 based on contracts signed in October from 80.9 in September. The index remains 20.5 percent below a surge to a cyclical peak of 112.4 in October 2009 ... The data reflects contracts and not closings, which normally occur with a lag time of one or two months. European bourses ended up 2% and more. Gold finished at $1389 and Oil was $87.79 up $1 and change. The major market measures gained 1% in light trading. Breadth was 2/1 to the good. November sales increase of 2% to $272 million, with comparable store sales flat for the month. Fourth quarter earnings guidance of $0.43 to $0.46 per diluted share. A $0.50 per share special cash dividend. A regular quarterly cash dividend of $0.11 per share with accelerated payment into December. Extension of the company’s 16 million share repurchase authorization, through February 2, 2013. Total sales for the four weeks ended November 27, 2010 increased 2% to $272 million, compared to $266 million for the four weeks ended November 28, 2009. Comparable store sales were flat for the month, compared to a 2% decrease for the same period last year. Total sales for the year-to-date period ended November 27, 2010 increased 3% to $2.32 billion, compared to $2.25 billion for the same period last year. Comparable store sales increased 1% for the year-to-date period, compared to a 7% decrease for the same period last year. The company completed the closure of MARTIN+OSA during the second quarter of 2010. Accordingly, MARTIN+OSA’s total sales for the current year-to-date period and all prior periods have been reclassified as discontinued operations and are not included in the results from continuing operations above. To access the company’s recorded monthly sales commentary, please dial (866) 514-0390, or internationally dial (585) 267-8021. The company is providing fourth quarter 2010 earnings guidance from continuing operations of $0.43 to $0.46 per diluted share. Fourth quarter guidance compares to earnings from continuing operations of $0.38 per diluted share last year. The company’s board of directors declared a $0.50 per share special cash dividend. In addition, the board declared a regular quarterly cash dividend of $0.11 per share, payment of which will be accelerated into December. As such, a cash dividend of $0.61 per share will be payable on December 27, 2010 to stockholders of record at the close of business on December 13, 2010. The board of directors also voted to extend the company’s current repurchase authorization of 16 million shares through February 2, 2013. Since 2005, the company has repurchased a total of 48.5 million shares for $938 million, which includes 14 million shares repurchased in 2010. Stocks are higher around the world as the Holiday season spreads its glow to bourses and banks. The reason given is that there is good economic data being released in various countries. Also stocks have been in a funk for a week and the attention span on the negative side for the past few months has been limited. Investors’ Intelligence has 55% Bulls and 21% Bears. That is not good news for contrarians who are long stocks (us). With any significant pop we may be quick on the trigger. Standpoint Research downgraded American Eagle Outfitters (NYSE: AEO) from Buy to Hold. The firm states, "AEO has run up 40% since August 12 and is fairly valued at 9X peak earnings from 2006-2008, 18X trailing twelve months earnings and 15X (rising) estimates for next year. The shares have out-performed the S&P-500 by more than 2000 bps since mid-August and will be challenged to out-perform the Index going forward..."For more ratings news on American Eagle Outfitters click here and for the rating history of American Eagle Outfitters click here. We added Dell and Barnes & Noble to accounts. The ADP employment report showed that private sector job creation picked up from an upwardly revised 82,000 in October to 93,000 in November. This is the largest gain in private sector hiring in three years and suggests that payroll employment, which will be released by the government on Friday, could exceed the consensus of about 150,000 jobs created in November. Our own estimate is for about 170,000 payroll jobs in the month of November. According to ADP's data, hiring in the service sector was strongest, as retailers and restaurants hired more than we have seen in recent years to staff up for the holiday season. It also appears that large firms may be outsourcing again to small businesses, which in turn is lifting employment for consulting. Manufacturing employment expanded modestly, while construction continued to decline. Gains in employment occurred across firm size, including small businesses. This is perhaps the most encouraging part of the report with respect to future employment gains because small business hiring is the backbone of job creation in the U.S. The bad news, of course, is that gains of this magnitude are still not enough to measurably reduce the unemployment rate, an issue that Federal Reserve Chairman Ben Bernanke underscored in comments on a panel at Ohio State University yesterday. More disturbing is the failure of Congress to extend unemployment benefits for the long-term unemployed. Some two million workers could lose roughly $300 a week in benefits by the end of the year, if some sort of extension is not passed. Another 2.7 million are at risk in early 2011, which would be a major blow to the economy given the extraordinary multipliers associated with unemployment insurance. The Congressional Budget Office estimates that we get back $1.90 in economic stimulus (spending) for every dollar spent on unemployment insurance. The Bottom Line: The economy appears to be gradually reaccelerating. Those gains will not be enough, however, to absorb the masses that have been unemployed for more than 26 weeks and could falter if Congress fails to extend benefits soon along with the Bush tax cuts, which are also up for extension. The tax cuts are more costly, in terms of the federal budget deficit than unemployment insurance extensions, but compensate with fewer multipliers for the economy. (Reuters) - General Motors Co's U.S. sales rose 11 percent overall in November, in line with gains projected for the industry amid a slow but steady return in consumer demand from the depressed levels a year earlier. Sales in GM's four remaining U.S. brands following its restructuring rose 21 percent in November from a year earlier, said GM, which completed the largest-ever IPO in November to return to the U.S. stock market. (MarketWatch) -- Ford Motor Co on Wednesday posted a 24.3% jump in November U.S. car sales to 147,338 vehicles. Ford unit sales have surged 21% so far this year compared with 2009 to easily outpace the broader industry's growth rate. Car sales in November rose 24.7%, sport utilities gained 13.1% and trucks surged 34%. Ford also said it plans to build 635,000 vehicles in the first quarter of 2011, up 11% from the prior year. Ford outsold Toyota (overall sales down 3%) for the month of November to take over the #2 spot behind GM. High gasoline prices continue even though inventories rose when a drop was expected. It’s called commodity speculation. (MarketWatch) -- Crude-oil futures slightly pared their gains Wednesday after the Department of Energy reported an unexpected increase in inventories. Crude for January delivery added $1.29, or 1.5%, to $85.41 a barrel on the New York Mercantile Exchange, slightly lower than earlier. Gasoline and heating oil futures prices were unchanged. The Energy Information Administration said crude-oil supplies rose 1.1 million barrels for the week ended Nov. 26, which contrasts with expectations of a draw around 1 million barrels. Gasoline inventories added 600,000 barrels, while supplies of distillates rose 200,000 barrels. Oil ended at $88.66 up $2.55 and Gold gained $3 to $1390. Many European bourses gained 2% on the day. The major market measures closed 2% higher in moderate trading. Breadth was 3/1 positive. Goldman Sachs speaks, market listen- for a few minutes at least. The US growth outlook has brightened significantly in recent weeks. As a result, we have raised our sights for 2011, calling for real GDP growth to average 2.7% for the year versus 2.0% previously. We expect growth to pick up further in 2012—to 3.6% on average for the year—though judgments that far out are clearly tentative. The main reason: recent data reveal a firmer trend in domestic final demand and suggest that it will be sustained via improvements in net hiring and credit availability. Meanwhile, the downside risk of a material tightening in federal fiscal policy—i.e., failure to extend expiring tax cuts—has diminished significantly. Although our revised outlook implies a meaningful drop in the jobless rate, it will remain high by historical standards, ending 2012 at about 8½%. With other measures of utilization also likely to show significant excess capacity, we expect core inflation to remain at the ½% year-to-year rate in 2012 that we have been forecasting for year-end 2011. In turn, this means that the Federal Open Market Committee (FOMC) is unlikely to increase the federal funds rate in 2011 and will probably stay on hold in 2012 as well. The future of unconventional easing is a much closer call. On balance, we think that Fed officials will buy more assets after the $600bn already committed. But we have scaled back our cumulative expectation for QE2 to $1trn from $2trn, and it is also possible that the program will end at $600bn. Risks exist on both sides. On the downside, we worry most that renewed home price declines—now expected to fall 5% or a bit more over the next year—will cause another round of consumer retrenchment; risks of a financial spillover from European debt woes and of significant fiscal tightening at home also lurk. On the upside: cash-rich companies may be more willing to spend on capital equipment or to expand payrolls than we now anticipate. 1. We have raised our sights for US growth in 2011 and expect further acceleration in real GDP in 2012. Specifically, our revised view calls for growth to remain at last quarter’s 2.5% annual rate through early 2011 and then increase over the next year to a 4% annual rate. On an annual average basis, we now expect real GDP to increase 2.7% (annual average basis) in 2011, versus 2.0% previously, and to increase 3.6% in 2012. These changes put us slightly above the latest Blue Chip median for 2011 (2.5% in early November) and—we suspect—above the median for 2012, to be published in January. 2. As a result, we now expect the jobless rate to fall to about 8½% by year-end 2012. This is implied by Okun’s law on the assumption that potential growth is currently about 2½%. (Okun’s law—which is really a rule of thumb that fits the data quite well—states that the unemployment rate will fall by half the difference between actual and potential growth over a one-year period.). Most of this decline occurs in 2012; over the four quarters of 2011 we expect only a marginal reduction from the current 9.6% rate, to about 9¼%. 3. Core inflation should remain low, at about ½% (year-to-year), through 2012. At 0.6% as of October, the CPI core inflation rate has nearly reached this point already, well ahead of schedule. The core price index for personal consumption expenditures (core PCE index) has a bit more to go, but is also clearly decelerating. Although we expect growth to rise materially above its potential rate over the next two years, the US economy will still be operating with considerable slack throughout the period—in the labor market and in other productive resources. This should keep core inflation from rising, while stable expectations of inflation keep it from falling below zero. 4. Monetary policy will remain highly accommodative. With the unemployment and core inflation rates continuing to run much weaker than their “mandate-consistent” levels (5%-6% for the jobless rate; just under 2% for inflation) throughout the forecast period, increases in interest rates are highly unlikely in 2011 and, we think, also in 2012. The outlook for LSAPs is less clear, as strong growth will stiffen the resistance from some members of the FOMC to extend this policy while large shortfalls vis-à-vis the committee’s employment and inflation objectives prompt others to press for more. On balance, we expect more LSAPs, but cumulating only to $1trn (versus $2trn previously), and we are not very confident of this call. Over the following three years, the private-sector balance rose sharply, as shown in Exhibit 2. The 12.5-point move from -3.9% of GDP in mid-2006 to +8.6% in mid-2009 triggered the deepest recession in post World War II US history. So why do we now expect growth to pick up? In a nutshell, it is because underlying demand has strengthened significantly, as shown in Exhibit 3. This chart plots the growth rate of real GDP (dark line) alongside the growth rate of underlying demand (light line). After a deep downturn from 2007 to mid-2009 and near-stagnation from mid-2009 to mid-2010, underlying demand is now accelerating sharply. Currently, it is on track for a 5% (annualized) growth rate in the fourth quarter. Why such a sharp acceleration? Our explanation is that the pace of private-sector deleveraging is slowing in an environment of somewhat lower debt/income ratios, improving credit quality, and moderating lending standards. In turn, the rise in spending relative to income is starting to generate positive multiplier effects via a stronger labor market, and this is feeding back into stronger income growth. Thus, we have also seen a notable improvement in jobless claims and (at least through October) in nonfarm payrolls. At the same time, one downside risk has diminished significantly. Although Congress has yet to enact a formal extension of the tax cuts scheduled to expire at the end of this month, both parties seem anxious to avoid the renewed downturn in economic activity that would likely occur if most of these cuts were not extended. Meanwhile, state income and sales tax revenues are now on the rise; this may reduce the fiscal restraint imposed by this sector as it begins its next budget round in the spring. In short, the improved tone of the US economic data has convinced us that the partial reversal of the 2006-2009 private-sector retrenchment that began in 2009 has evolved into a more durable trend. To borrow Chairman Bernanke’s metaphor, the hand-off from policy stimulus to private demand—which seemed elusive just a couple of months ago—now appears to be developing. Over the next two years we now expect the private-sector balance to fall from +6.5% in the third quarter of 2010 to 4.5% in the fourth quarter of 2012. 2. We are not saying that deleveraging is over. We still expect private-sector debt/income ratios to decline further. But it is the pace of deleveraging—which corresponds to the level of the private sector balance—that matters for GDP. As the pace of deleveraging slows, the private sector balance falls, and this implies a positive impulse to GDP growth. 4. We are not saying that the economy will feel good from a “Main Street” perspective. As already noted, we only expect a gradual decline in unemployment as growth moves above trend, to 9¼% by the end of 2011 and 8½% by the end of 2012. This is still very high by any absolute standard and far above our 5½% estimate of the structural unemployment rate. 5. With so much slack in the system, inflation is likely to stay well below the Fed’s “mandate-consistent” level of just under 2%, as noted above. This implies that Fed officials will continue to miss both parts of their dual mandate by large margins, and are apt to keep monetary policy very accommodative as a result. Even with our new forecasts, and even if we take into account the quantitative and fiscal policy easing that has already occurred, our analysis of the Fed’s reaction function implies that rate hikes are very unlikely in 2011 and—based on our economic forecasts—will probably not occur in 2012 either. 6. The future of LSAPs is a much closer call. Barring very large surprises in the economic data, we are convinced that Fed officials will complete their $600bn purchase program. But the pickup in growth and the backlash against this program, both at home and abroad have made us more uncertain about further purchases beyond June. On balance, we think that Fed officials will still buy more, pushing the total amount up to perhaps $1 trillion. But it is also possible that LSAPs will end at $600bn. Like any forecast, this one has risks on both sides. On the downside, the risk that worries us most is the potential for a significant renewed drop in home prices to trigger another round of consumer retrenchment. We have been estimating that prices would drop only 2½%-3½% over the next couple of years, but as the passage of time allows us to pin down the effects of the homebuyer tax credit more precisely, we now estimate that prices could drop 5% or a bit more over the next year. This still looks manageable, but sharper declines could change the picture fairly quickly. The risk that currently worries markets the most is the potential for contagion from the European debt crisis. We agree that the US economy is vulnerable to these events, but probably only if it affects financial conditions via a materially stronger dollar, lower equity prices, and/or renewed stress in the interbank lending market. Finally, although prospects of a fiscal accident at home have diminished significantly, they have not disappeared altogether. Stalemate in Washington would pose an obvious, and large, risk to the near-term growth outlook. On the upside, the main risk is that we have misjudged companies’ willingness to spend, either on physical capital or to expand their workforces. In terms of capital spending, outlays for equipment and software have risen much more over the past year than we had anticipated. Much of this appears to be a short replacement cycle for high-tech equipment, and we therefore expect some slowing in the near term as the replacement cycle winds down and utilization rates for other equipment and for structures remain low. But with private demand now picking up steam, cash-rich companies may surprise us by expanding or modernizing productive capacity more aggressively. They could also hire more permanent workers than we now expect. It is also conceivable that the fiscal negotiations currently underway between the Obama administration and the Republican congressional leadership produce unexpected growth-positive outcomes. A payroll tax holiday is one commonly mentioned measure, and unemployment benefits could also be extended for longer than the three months we now anticipate. NEW YORK (AP) -- When Barnes & Noble Inc. began to sell its first electronic reading device, the Nook, a year ago, I found it as welcome as a bookcase landing on my toe. It was a terrible design -- slow, confusing and buggy. The original Nook had two screens: one big, Kindle-like gray-scale "electronic ink" display for reading and one small touch-enabled color display for navigation. It was like an unholy marriage between a Kindle and an iPod Touch, worse than either product on its own. Other color e-book readers have hit the market this year from smaller names, including Sharper Image with its Literati. They've been hampered by poor screens that make the text shimmer uncomfortably. Barnes & Noble's screen uses the same technology as Apple Inc. does for its iPad, and it's wonderfully crisp. E-ink readers such as the Kindle do have one selling point: They provide a more paper-like reading experience, which sounds attractive to people who find that staring at a computer screen for hours on end is uncomfortable. However, I believe most of this discomfort derives from screens that are set to shine too brightly. I found the Nookcolor quite comfortable to read on, partly because it's easy to adjust the brightness of the backlight for pretty much any reading environment. Blazing sunshine will still wash the screen out, though. Most importantly, the touch-sensitive color screen makes navigation much easier. The Nook's software isn't exemplary in its clarity and I did experience a few glitches, but it's not hard to get the hang of it. -- Amazon.com Inc.'s Kindle has stuck to e-ink technology, which has been the norm for e-readers so far. It has only one virtue: It's easy to read in broad daylight. In all other ways, e-ink is a disastrous technology and makes navigation a chore. The Kindle can't show color, scroll or zoom images, and the text is dark grey on a light grey background. It doesn't come with its own light source. In the Kindle's favor, the reader is cheaper, available for as low as $139. There's also a $189 version that comes with free access to AT&T Inc.'s cellular broadband network. (The first Nook was cellular too, but the current version relies solely on Wi-Fi hotspots.) The Kindle is about the same size as the Nookcolor, but weighs half as much. The Kindle doesn't accept e-books from public libraries. The Nook does, though it treats them as second-class citizens. They can't been pinned to the "home" reading screen, so firing them up takes more time than with other titles. -- Apple Inc.'s iPad does far, far more than the Nook, and it is much better at presenting magazines and newspapers, thanks to a screen that's twice as big. Magazines, in particular, are terribly clumsy to navigate on the Nook. The Nookcolor is more portable and cheaper, and its screen brightness can be turned up higher, so it's a better choice if you plan to mainly use the tablet for reading novels. The iPad is better in every other way, so buy one if you can afford the $499 starting price. Apple's iPod Touch is a viable e-book reader as well and starts at $229, making it slightly cheaper than the Nook. The screen is a third of the size of the Nook's. Like the iPad, the iPod Touch can access not just Barnes & Noble's e-book store, but scores of others, including Amazon's Kindle store. However, the small screen means that it's best bought as a general entertainment device. If you really want something to read books on, the Nook is a better choice. The Nook is based on Google Inc.'s smart-phone operating system, Android, but it doesn't run any of the tens of thousands of third-party Android programs, or apps, that are available for phones. Barnes & Noble plans to launch its own app store early next year. In the meantime, the Nook does come with a Web browser and a couple of apps, including Sudoku and Pandora's Internet music service. Barnes & Noble is taking advantage of the color touch screen by selling children's books with built-in narration tracks. It's a fine idea, and my 3-year-old daughter soon got the hang of starting up the device, navigating to a book, and following along by swiping the screen to go from page to page. But the books cost $8 each, while iPhone and iPad apps that are more engaging and animated, such as a version of "Dr. Seuss "Green Eggs and Ham," cost just $2 each. I don't think dedicated e-readers are going to get much better than the Nook, at least not when it comes to the hardware. Maybe they'll become a bit slimmer and lighter and have longer-lasting batteries, but there won't be much time for big improvements, because within a few years, general-purpose tablets such as the iPad and Samsung Galaxy Tab will have taken over this niche. Though it may get some more apps next year, the Nook won't be able to match the versatility of a general-purpose tablet. The Nookcolor could use one immediate improvement: a space between "Nook" and "color." As it is, the name sounds too much like a mispronunciation of "nuclear" when you say it too fast, and that's not a word you want to stumble into when you're at an airport security checkpoint. But other than that, it's a good choice for someone who doesn't want to spring for an iPad. Welcome to adulthood, e-readers.